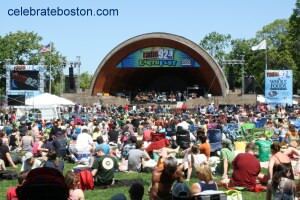 The 23nd Annual EarthFest, sponsored by Radio 92.9 and Whole Foods Market, will be held on Saturday May 21, 2016 at the Hatch Shell in Boston, with gates opening at 10:00 am. The Radio 92.9 EarthFest is usually the largest free radio station concert in Boston. The event is produced in conjunction with the Massachusetts Department of Conservation and Recreation. Past events have drawn upwards of 100,000 people. Music on the main stage starts at 11:30 am, and this year's event will feature performances by Fitz and the Tantrums, Joywave, The Strumbellas, and local band Flight of Fire, that won a Battle of the Bands contest. The festival will also feature exhibits and environmental displays, staffed by sponsors and non-profit environmental organizations from New England. Each exhibitor is committed to raising awareness and offering educational information about different environmental issues facing the planet. In addition to the musical performances on the main stage, the 2016 Radio 92.9 EarthFest will also feature once again The Kids Planet—an expanded interactive family area. The Kids Planet will feature a wide variety of musical acts and entertainment as well as environmental activities and educational displays. Musical performers and artists include Scottish Fish, Stacey Peasley Band, Vanessa Trien and Jumping Monkeys, ZUMIX African Drumming, Tabata Kids Exercise, and Kids Family Friendly Yoga. Additional activities in The Kids Planet range from face painting to healthy treats, compliments of Whole Foods Market and a variety of other vendors. Numerous booths onsite will offer educational displays, exhibits and food sampling. The booths will be staffed by event sponsors and local environmental and non-profit organizations. Read articles about Radio 929 EarthFest 2013, 2012, 2011, 2010, and 2009. Security Notes: The current protocol for similar events is checkpoint entry with almost no bags allowed. See-through plastic tote bags may be required. Entry is via the Charles or Dartmouth Street Footbridges, with the Arlington Street bridge closed. Footbridge access to the Esplanade may be redirected at any time.